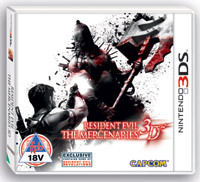 Being one of my all-time favourite survival horror games, I was pretty damn excited to take the 3DS on its maiden cruise with this one. After some training levels to get to know your character's movements, interaction & weapon handling, you're off on a new eye-popping trip with this terrifying franchise. Series veterans like Chris Redfield and Jill Valentine are in the character roster (with more to unlock), and the expected range of firepower and villainous zombies & freaks are on hand to blow away, the creepy factor as high as always. This (literally) new dimension to the series is quite a step up, as with the 4th Resident Evil Afterlife movie's 3D madness - only here you're in control. Duo-play with another 3DS gamer has many advantages including resuscitating your partner, and Internet play takes you global. A demo of the new Revelations can also be tried out.